They are fierce predators! Some can bore a hole through the prey's shell. It takes them a long time to get at their prey. Don't remove drills. 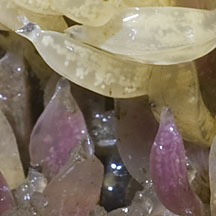 Some lay large collections of egg capsules on the rocks. Where seen? You will almost be certain to meet this ferocious predator on our rocky shores! Drills are commonly seen on boulders and rocks, including man-made structures such as breakwaters and jetty pilings. 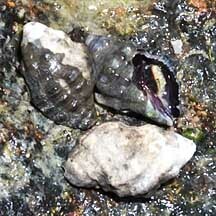 Features: Among the common drill species on our shores are Rock-shell (Thais sp. ), Drupes (Morula sp.) and Murex (Chicoreus sp.). Drills usually have thick shells and a thick operculum made of a horn-like material. Those with complicated spines on their shells usually move by holding their shells above the surface as they move along the surface. Bored to Death: Drills that live on the rocks are predatory molluscs that bore into other shelled creatures, especially barnacles. 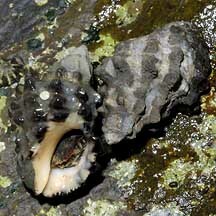 To bore a hole through the victim's shell, a drilling snail softens the shell with a weak acid secreted by a special gland on the underside of its foot. 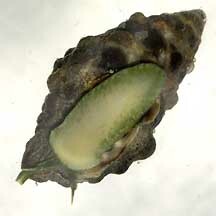 The softened shell is then slowly scraped off by the snail's radula. The radula is the main physical tool in creating the hole. It can take eight hours for a drill to get through a shell 2mm thick. Yawn! 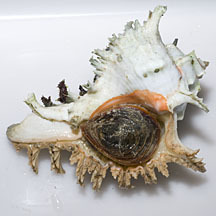 Other drill food and feeding methods: Some drills may also pry open the shells of bivalves with a tooth on the lip of their shell. 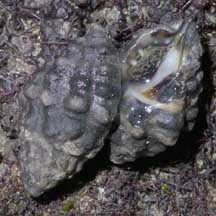 Others may also get to limpets by inserting their proboscis under the limpet's shell. Some may also hunt buried clams. 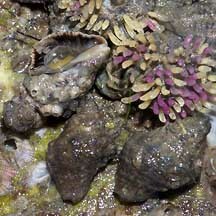 Some prey on worms, the eggs of other snails and even corals. Some deeper-water members of the Family Muricidae eat worms and sea urchins. To dye for: Many drills have a gland that secretes a colourless mucus that turns purplish when exposed to air. This secretion is a neurotoxin that paralyses or kills other sea creatures. Humans have used this mucus as a rare dye (see below). 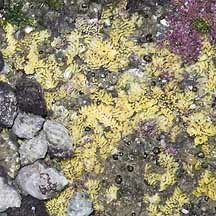 Drill Babies: Some drills lay masses of bright yellow egg capsules. 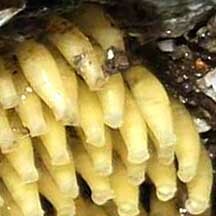 Each egg capsule may contain 20-40 eggs. 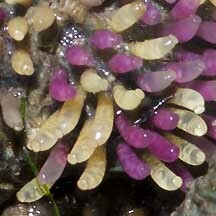 The egg capsules turn purple when the free-swimming larvae hatch. These swim about for a few weeks before they change into crawling juveniles. 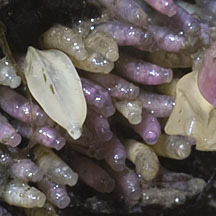 In some, however, crawling juveniles emerge from the egg capsules. Human uses: Since 1,500 BC in the Mediterranean, snails of the Family Muricidae were harvested to produce a dye called Tyrian purple (which was actually more maroon). The dye resisted fading, but involved so much labour to produce that only royalty and the very rich could afford it. Thousands of shells were crushed to obtain minute quantities of the dye. The dye was worth several times its weight in gold. The dye industry brought fame and fortune to Tyre (now modern Lebanon). Tyre was a great Phoenician city. In fact Phoenicia means "purple people". Tyre ruled the seas and founded prosperous colonies such as Cadiz and Carthage. The prosperity of Tyre allowed the arts and sciences to flourish. For example, Marinus of Tyre was considered the founder of mathematical geography and introduced the concept of latitude and longitude in map design. As merchants who needed to keep records, the Phoenicians simplified the 550 characters in the cuneiform alphabet with a phonetic alphabet, based on distinct sounds, consisting of 22 alphabets. This alphabet, with modifications introduced by the Greeks and Romans, is the one we use today. 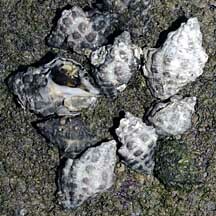 Voracious predators, some drills are considered a pest on oyster farms in Taiwan and Japan. Recently, drills have become useful as bioindicators of pollutants in the environment, such as for anti-fouling chemicals used to prevent encrusting animals from growing on ships and other installations in the sea. The toxins kill drill larvae, or result in deformities in adults. 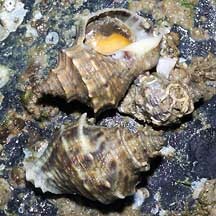 Status and threats: Chicoreus ramosus is listed as 'Endangered' and the Murex snail (Murex trapa) as 'Vulnerable' in the Red List of threatened animals of Singapore. Our other drills are not on this list. However, like other creatures of the intertidal zone, they are affected by human activities such as reclamation and pollution. Trampling by careless visitors and over-collection can also have an impact on local populations. A 'gang' of drills stuck onto a clam. 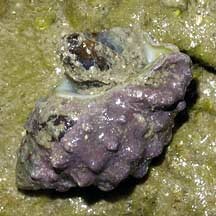 small bivalve in its shell opening. Different kinds of Drill egg capsules. from Tan Siong Kiat and Henrietta P. M. Woo, 2010 Preliminary Checklist of The Molluscs of Singapore. Species are difficult to positively identify without close examination. Drill (Thais gradata) and Ketem (Chicoreus capucinus) Ng, Peter K. L. & N. Sivasothi, 1999. A Guide to the Mangroves of Singapore II (Animal Diversity). Singapore Science Centre. 168 pp. 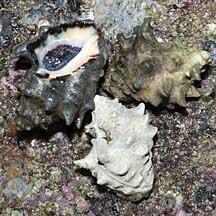 Spiny Murex (Murex martineaus), Mangrove Murex (Chicoreus capucinus), Thais and Morula Tan, Leo W. H. & Ng, Peter K. L., 1988. A Guide to Seashore Life. The Singapore Science Centre, Singapore. 160 pp. 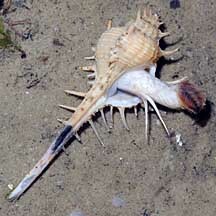 Ramose murex (Chicoreus ramosus) and Rare-spined murex (Murex trapa) on the NParks Flora and Fauna website. Family Muricidae (Murex, Rock or Coral shells) on the The Seashells of New South Wales website by Des Beechey Research Associate, Australian Museum: family introductions with photos of shells and detailed fact sheets for many species. 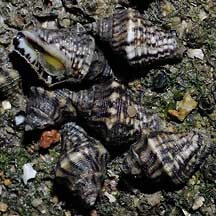 Murex shells (Family Muricidae) on Life on Australian Seashores by Keith Davey on the Marine Education Society of Australia website: Fact sheet on drills and details on various species found in Australia. Family Muricidae in the Gastropods section by J.M. Poutiers in the FAO Species Identification Guide for Fishery Purposes: The Living Marine Resources of the Western Central Pacific Volume 1: Seaweeds, corals, bivalves and gastropods on the Food and Agriculture Organization of the United Nations (FAO) website. Use of molluscs for personal adornment on the Man and Molluscs website: an introduction to the wide range of dyes produced by members of the Family Muricidae with links to photos of the shells. Tyrian purple: details about the chemical structure of the dye and how it was collected in the past and a massive bibliography of further readings on the subject. Ng Hiong Eng & Chan Sow Yan. 28 Apr 2017. 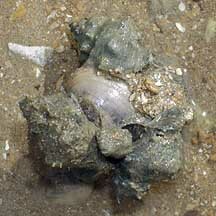 Record of three marine snails from the Singapore Strait: Tenguella ceylonica and Tenguella granulata. Singapore Biodiversity Records 2017: 50. Tan Heok Hui & Toh Chay Hoon. 30 December 2016. 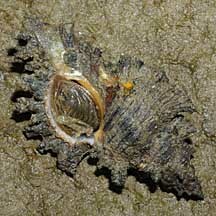 Recent record of black-spined murex (Murex ternispina) at Pulau Sudong. Singapore Biodiversity Records 216: 179. K.S. TAN and J.B. Sigurdsson. 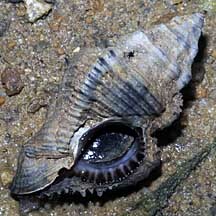 New species of Thais (Neogastropoda, Muricidae) from Singapore with a re-description of Thais javanica (Philippi, 1848). Journal of Molluscan Studies (1996) 62. 517-535.